Nice & Soft. Kinda heavy, mostly for the cold nights. I have a lot of allergens. That's why 100% cotton. Love the fact you different colors available. I got the dark purple. I purchased the white duvet cover, and the picture is a little misleading. The picture available clearly shows the duvet having even striped, but the duvet cover in fact has an uneven stripe-pattern instead. This pattern is only on one side of the duvet, so if you're looking for a completely plain duvet you should know that the underside is solid. The fabric itself feels really nice, although I washed it before using it because there was clearly starch used to press it in the factory. The duvet cover is a little large for my duvet cover but works fine (I have a full sized duvet cover, not a queen). Fabric: heavy duty, feels high end, is not thin Closures: buttons, corners are seamed so your duvet won't pop out (bonus points!) Pattern: different from what I expected but I still like it a lot Overall: For $70, you could do a lot worse. This was a great purchase. Had such a hard time finding a duvet cover to fit our 90x98 full/queen comforter. Overstock was the only place that had this size. Love the color, fit and quality. Duvet covers are comfortable and classy. 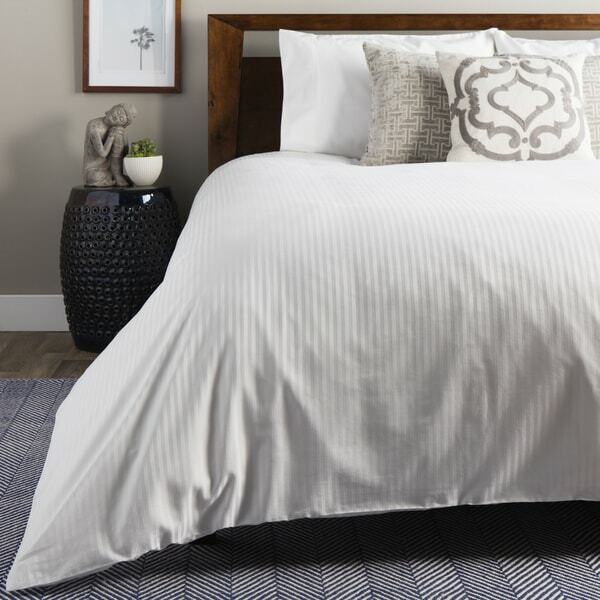 You can never go wrong with Egyptian cotton. The sage color on these covers are a rich sage color. So, expect a deeper sage color that will help contrast a lighter room with lighters accents. So soft and high quality! I love this duvet cover! I've had it for months now it and is so soft and has not pilled at all! I did not know what to expect as there wasn't much description but it is so nice. Amazing price for how nice it is. 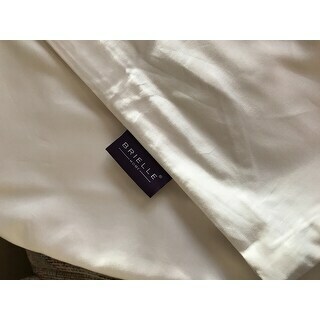 The quality of the duvet cover is good, it does show wrinkles. I am giving it 3 stars because the stripes in the photo are not the same as the cover. The duvet actually as intermittent narrow stripes with wide stripes. I would have returned but I needed the dimensions of this duvet for my comforter. I purchased the ivory color in King size - it is solid ivory no stripes at all. If it wasn’t *** to return I would return it because it is not at all the what I wanted. It has a weird plastic smell that I’m sure will wash/air out. I just wish for such an expensive cover it was accurately listed. Excellent material, I wish it came with pillow/sham covers especially at that price. So soft & feels great! I purchased this to replace an old duvet. This one has a great hand and is so soft. I can't wait to sleep in it. i thought it was beautiful when I first got it home and because new items have a smell I washed it and now it just looks very dull but I kept it since I will at a later date go ahead and buy a new comforter...would not reccomend!! Silky feel, nicely made.Hopefully will stay wrinkle free. Good fit. The comforter stays in place. Soft. Great quality and looks good. Perfect for the queen size comforter. Its so heavy that I have to strain to move the comforter at night. Feel like a lead blanket is on me. Ruining my sleep. I was looking for an oversized cover for my new comforter and this fit perfectly. The quality and feel of the material is excellent. I highly recommend if you are looking for a cover for an oversized comforter! The cover it's self was pretty and it fit great. Only giving it 4 stars because it did NOT have ties like it said in description. To me that was the strongest selling point. Would return it but its the only one I could find to fit oversize duvet. "When clicking on the "size" requirement it gives you three options: Full/Queen, Full-Queen, and King size. I ordered "Full-Queen". I am hoping that it is 90"x98". What is the difference between the two sizes: Full/Queen and Full-Queen? I am confused." There is not a difference between the two Full/Queen options, it was listed twice by mistake. A Full/Queen is indeed 90 inches x 98 inches. We do apologize for the confusion. "How dark is the stone color? It's hard to tell." Not to dark, middle ground. "Does this duvet cover have corner ties inside to keep the duvet in place?" Yes it has the corner ties. Nice cover. "What's the weight on the king size ?" The king size weighs approximately 4lbs. I needed a duvet cover and I like the color of sage. Also the thread count is good. "Will you big getting Canvas stripe? Its not in the alert me drop down section?" We do not know if the canvas will be restocked. "Picture of white set shows stripes but the blue and red seem solid, which picture is correct? " "We have both solid and striped options please see the list of options below: BLUE, IVORY, WHITE, SAGE, CHOCOLATE, Brick Red, Purple, WHITE STRIPE, CANVAS STRIPE, GREY STRIPE, STONE GREY"